Dublin based Ronan Grimes broke into the top ten in the 1km Time Trial at his first track world championship event finishing in ninth place tonight; gold went to GB’s Jody Cundy ahead of Jozef Metelka (Slovakia) and USA’s Jacob Waters taking bronze. 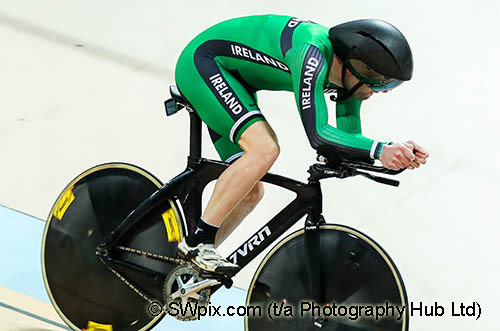 Colin Lynch was 13th in the Individual Pursuit which was won by Canada’s Tristen Chernove ahead of Guihua Liang (CHN). Arslan Gilmutdinov from Russia rounded off the podium with bronze. The UCI 2018 Para-cycling Track World Championships take place in Rio de Janeiro, Brazil from the 22-25 March. “That was a great experience,” said Galway born Grimes after the 1km race, where his finishing time was 1.11.595. “The time of 1.11 is something I would have grabbed at before the race, so I have to be happy with that, and it’s a top ten too. I have a lot of positives to take from it – and a lot to learn too. The 29-year-old Scott-Orwell Wheelers rider enjoyed his track cycling debut at a major championships – “The track isn’t something I have a whole lot of experience in and the kilo is not something I have a speciality in. The nerves were setting in an hour or so beforehand. The hour went by very quickly, and I was up on the boards before I knew it! “On Saturday I will race in the pursuit – and hopefully that is something I have more aptitude for, with my endurance background.” Tomorrow Grimes will get an opportunity to recover before competing again on Saturday and Sunday. “I’m massively disappointed with my ride today,” reflected Lynch, who won a Paralympic silver medallist in the Time Trial in 2016. His time of 4.06.390 was significantly off his personal best of 3.43.423. The UK based rider has kept his focus on the road in recent years, netting rewards by claiming the overall win in the World Cup Series in 2017, to top off his successful Paralympic campaign. Lynch has not raced in the power based 1km Time Trial in four years, which takes place at approximately 6pm Irish time tomorrow, with the Scratch qualifiers at approximately 9.30pm. Tomorrow’s action will commence with Paralympic and Double World Championships Katie-George Dunlevy and Eve McCrystal testing themselves in the race against the clock - the 3km Individual Pursuit. 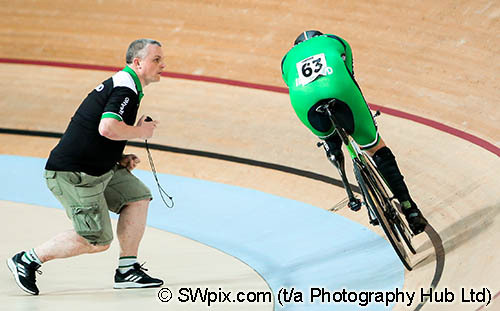 Also competing in the Individual Pursuit is the tandem pairing of Peter Ryan and Sean Hahessy. Classification is a unique and integral part of Paralympic sport. It provides the structure to separate athletes with similar levels of impairments into groups, or classes as they are commonly known, so they can compete in fair and equal competitions against one another, and ensure that winning is determined by skill, fitness, power, endurance, tactical ability and mental focus. This same principle exists in non-Paralympic sports where athletes are classified according to age, gender or weight divisions to allow for as fair competition as possible. In para-cycling there are fourteen classifications based on functional disability type. B refers to the tandems, where the stoker is blind or visually impaired, and the pilot is sighted. H represents the handcycling events, and C refers to cyclists on regular, but adapted, solo bikes, who may have cerebral palsy, limb impairments and amputations. In these events the categories have numbers denoting the level of impairment, the lower numbers the more severe the impairments and the higher less so.